Maybe this has happened to you: When traveling, you attempt to make a purchase, but your card is declined. Your credit card company has marked your purchase attempt as potentially fraudulent, and you may have to contact your bank and verify your identity before you can do anything else. This leaves you feeling very inconvenienced and probably unsettled. These were the words shared by one panelist at the University of Delaware’s Fraud Detection & Cyber Security in Financial Services Conference panel discussion, where banking experts discussed the future of technology in credit card fraud detection. 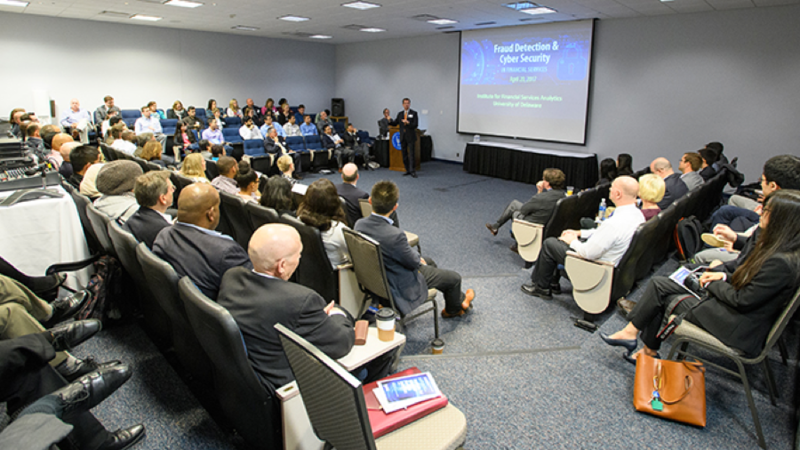 Sponsored by UD’s Institute for Financial Services Analytics (IFSA), the conference included multiple presentations as well as the panel discussion, which featured professionals from Barclay’s, Citibank, JPMorgan Chase, Bank of America and Capital One. Co-moderating the panel were Jimmy Li, business director of Capital One, and Bintong Chen, director of IFSA. Other panelists discussed solutions that stress communication with customers – for example, a text message alert that gives customers the opportunity to easily confirm or deny the legitimacy of a purchase. The panel also discussed challenges facing financial services analytics, like the need for bank card issuers to work with merchants to access more data. “The question is always ‘Do we have enough data?’ and the answer is always ‘No,’” said another panelist. “You always want more data. I would love to have more participation from merchants sharing their data. Despite the competition between the companies, however, the panelists stressed the importance of working together against the common threat of credit card fraud. “What we’ve all found is that if one of us is being targeted, the others probably are as well,” a panelist said. The panelist discussed one solution of using third party firms to help different companies pull their data together. 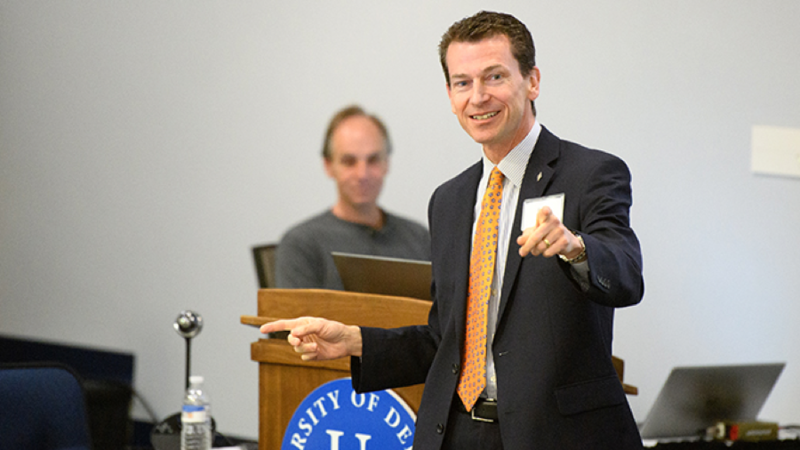 Contributing to this effort, Weber continued, is UD’s unique doctorate in financial services analytics program, which combines data science, computer science and financial services operations. These are the areas, Weber contested, that are the drivers of performance and risk at today’s financial services institutions. Lerner also offers other finance programs, such as the master of science in finance program. Students in this program graduate ready to meet a growing demand for principled financial experts capable of practical, hands-on business problem solving.